Get Ready to Swipe & Roll NetEnt-Style! NetEnt pays tribute to the totemic era signifying the birth of Rock ‘n’ Roll via originality, exceptional gaming pleasure and marvellous winnings served with a splash of sentimental charm. Entering the surreal 50s diner enable players to escape to a magical era gone by, where ultimate winnings are served in an ambience filled with scatters and substituting wilds. What catches the eye first is the archetypal time-period exterior enhanced by a virtual smell of cuisine listed on the menu, including club sandwiches, French fries and burgers each enough to drastically increase your desire for fast-food and super-fast winnings. Swipe & Roll brings back memories of a classic diner culture, a jukebox inviting patrons to select Chuck Berry, Jerry Lee Lewis or Little Richard hits. No playlist could bare the absence of Elvis Presley, an unknown 50s wildcard that rocketed to stardom. Swipe & Roll is here to stay, and NetEnt’s diner opens on the 7th of August, cancel your schedule and bop along to 1950’s rock ‘n’ roll tunes in true vintage style. Three antiquated posters decorate the neon-lit front façade of the diner to attract passers-by via bonus specials including 3X wilds, bonus game and coin wheel prizes. The main event displayed in bright neon announces winning worth up to 1,620,000 coins. Upon entrance good old rock ‘n’ roll sounds welcome reminiscing newcomers as flashing lights, and massive prize announcements draw attention to the slots. 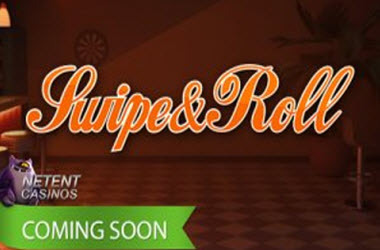 Swipe & Roll features 20 paylines draped across 5 evocative reels in a brilliant way that resembles, classic play. A generous dose of surprisingly good bonus features accompanied by rock ‘n’ roll sound get your toes in the mood to dance the night away. Everyone gets to experience a wild winning streak via two types of wilds appearing in the base and re-spins rounds. 3x wilds keep to the 2nd, 3rd and 4th reels to stand in for others. Three wilds activate the wild re-spin feature. This causes the wild present to remain in position as the wild re-spin jumps into auto-start. The arrow symbol expands one step down or up during the wheel bonus round, and coin wins reach up to 1,080 coins. The coin wheel can activate the bonus game, and players get the chance to swipe three reels down or up. Wheels contain arrows, as well as coins and three arrows appearing in the expanded area, causes further expansion, a repetitive action that continues until no further arrows appear. With the expansion that can grow up to 5 rows swiping players can look forward to payouts worth up to 4,320 coins. With wilds reaching multipliers of up to 27x it is no wonder fans find it extremely difficult to wait for this enjoyable rockabilly rift since winnings worth 1,620,000 is what greasers have been waiting for all along! Looking to play NetEnt Slots? – then visit Reviewslots.org for all your online slots and casino exitment.